Strep obviously disrupts sleep but there's more to the picture. My family had strep this week. Well, actually my kids and I did. My husband escaped – so far. Don't hate us, but our kids don't tend to have disrupted sleep, even through sickness. This sickness go around was different, both of my kids were waking and very restless during waking. My daughter was breathing loudly. At first, I dismissed it due to congestion, but after a week it was getting worse. During the day she was exhausted because even though she was sleeping 12 + hours at night, she was not able to breathe, which caused her sleep to not be restorative. 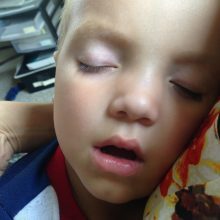 My son, did not breathe loudly but his sleep was still quite disrupted; waking up crying and having a hard time re-settling. He even wet the bed (which has only ever happened in the past when he was overtired). After my daughter complained about her ear aching we took her to the urgent care and she tested positive for strep. The doctor explained that this type of strep targeted the tonsils. I suspected my son had the same thing even though he was not snoring or breathing loudly. The next day we had my son tested and sure enough, he tested positive for strep as well. This taught me a lesson: children may not have to breathe loudly to have obstructive sleep apnea. When I talk with families about ruling out any underlying health conditions I am often met with confusion because the child often does not have obvious symptoms that would point to an underlying health condition. If you’ve done everything in your power to improve your child's sleep but it is still disrupted, please consider having your child's blood tested, tonsils and adenoids examined, and iron and ferritin levels checked. After we found out what was causing my children's disrupted sleep they have been able to recover and sleep soundly. It does no good to be in denial about the possibility of an underlying health condition, and sometimes the only symptom a child may experience is chronically disrupted sleep. If you have done all in your power to get your child's sleep on track with little to no progress, please consider the possibility of an underlying health condition. You are your child's biggest advocate, and advocating for health and healthy sleep is one of the best gifts you can give your child.